In November, I spoke to an overflow crowd gathered in Duke University's Lilly Library for Larry Goodwyn's unusual memorial service. Unusual? Well, it was the first memorial I'd ever been to that had to have an intermission! That was because the "honoree" himself was such an unusual character (pugnacious populist agitator, rebellious scholar, powerful writer, demanding mentor, and passionate protagonist for social justice), so a long line of folks had tales to tell. But what struck me as most unusual was that the attendees were not merely spending three hours looking back at a life well lived, but almost gleefully looking forward. Goodwyn was the modern-day guru of American Populism. He'd been on the front lines of both progressive academics and activism for more than six decades, blending his work as a renowned scholar of the 19th century Populist movement with his own practice of populism as a strategist and foot soldier in the civil rights, labor, and other grassroots social movements of his time. In 1976, he literally rewrote the textbooks with his path-changing work, Democratic Promise: The Populist Moment In American History. This penetrating volume thoroughly debunked the ivory tower historians of the establishment who had condescendingly dismissed the Populists of the late 1800s as nothing but a bumbling bunch of demagogic, racist rubes in southern backwaters. Au contraire, as we Texans say. Professor Goodwyn showed that the populist revolt against the unbridled greed of the robber baron era was a highly sophisticated mass movement. It gave downtrodden millions a voice and an empowering sense of themselves as democratic citizens. Through the movement's cooperative structure, grassroots people -- who'd been isolated from each other, were mostly impoverished, and were often illiterate -- learned how to address their own conditions and created new ways to work together to achieve their aspirations. Radically progressive, the movement included both African-Americans and urban unionists in its ranks and leadership, and it aimed for major structural changes to democratize the economic and political systems. Populism surged across the country into 43 states, from California to New York. Historian Wesley Hogan, a former student of Larry's, notes that Democratic Promise elevated the historical significance of common "farmers, steel workers, day laborers, and sharecroppers," showing how they had "found stunning new ways to act democratically." Goodwyn, she added, "made this history vivid and touchable. He encouraged us to dream democracy anew." At Larry's memorial, optimism about the prospects of that dream was sparking across the room, prompting an un-funereal glee. The informal conversations among us Goodwynistas were about the encouraging signs we're now seeing of a Populist renewal percolating up from America's grassroots. The renewal is as yet more a series of sustained actions than a movement. But all of those people-fired actions are in rebellion against various forms of corporate imperiousness from fracking to the imposition of a poverty-wage ethic in our rich land, and all are being joined by large numbers of people who've not previously been politically active nor counted as progressive. Yes, Larry Goodwyn has died, but the democratic possibilities that were his life's work suddenly seem more within America's reach today than we could have imagined 10 or even five years ago. At the close of my remembrance of Goodwyn, I usurped an advertising slogan that a local moving company was using when I first migrated to Austin, Texas, in 1976. The company was just a little outfit consisting of one truck and two burly guys whose names, as I recall, were something like Skeeter and Booger. But their slogan expressed a big, positive, populistic outlook: "If we can get it loose," they asserted, "we can move it." That not only fit Larry's decades-long effort to free the true meaning of American Populism from the historical dustbin, but it's also apt for the promising emergence of a new Populist moment in our history. My father, W.F. "High" Hightower, was a populist. Only, he didn't know it. Didn't know the word, much less the history or anything about populism's rich democratic ethos. But he knew about bankers who regularly squeezed small-business families like ours with usurious interest rates. He knew how rough it was for a local business to fight off deep-pocketed chain stores that use predatory pricing and sledgehammer advertising budgets to seize local markets. And he saw with his very own eyes that the governor and legislature in faraway Austin operated as subsidiaries of Big Oil, the utility monopolies, and the other giants that were allowed to profit by picking the pockets of the general public. He and my mother Lillie knew one other thing, too: There was once a Democratic Party that stood up for regular folks and actively promoted the ethic of the common good. Having been raised on hard-scrabble Texas farms and come of age in the Depression, they didn't see the New Deal through ideological glasses, but simply as the help they and the rest of America needed -- a path out of both depression and the Depression. That path eventually allowed my parents to scramble into America's lower middle class. Moreover, the New Deal's outreach gave my father, who was not at all philosophical, a phrase that he used occasionally to express the gist of his political beliefs: "Everybody does better when everybody does better." That is Populism. Neither right nor left, Republican or Democrat, it is not based on ideology, but on two gut-level fundamentals: (1) our people's historic aspiration for a society and nation of fairness, justice, and equal opportunity for all; and (2) the actual life experience of people who see those values routinely trampled by domineering elites. The meaner and broader the trampling gets, the quicker a populist fever can spread, and it has erupted periodically throughout our history in organized rebellions against the repressive and exploitative forces of Big Money. 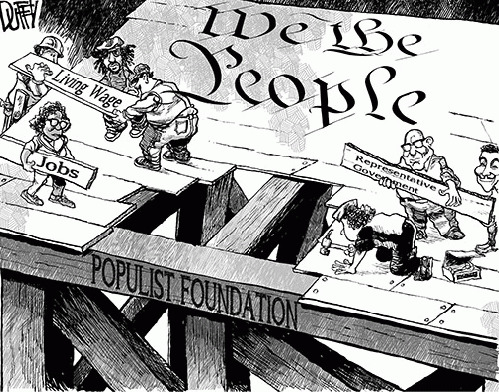 Populist fights are direct confrontations over this recurring reality: With too few people controlling too much of the money and power, they use that control to grab more for themselves at the expense of the many. Before the Populists of the late 1800s gave this instinctive rebelliousness a name, it had long been established as a defining trait of our national character: The 1776 rebellion was not only against King George III's government but against the corporate tyranny of such British monopolists as the East India Trading Company. The establishment certainly doesn't celebrate the populist spirit, and our educational system dutifully avoids bothering students with our vibrant, human story of constant battles, big and small, mounted by feisty "little people" against... well, against the establishment.